Earlier we heard a rumor from Keith Law that the Pittsburgh Pirates would listen on center fielder Andrew McCutchen. Since that report came out, we’ve heard from Dejan Kovacevic that the Pirates aren’t trading McCutchen and have no intention of doing so. Law’s report never said the team was shopping McCutchen, just that he isn’t untouchable for the right deal, which is an approach the Pirates should take with any player. Even if the team wanted to trade McCutchen, I think any attempt at a deal would be impossible. I reviewed McCutchen’s trade value in July, but now would be a good time as any to update the value, taking the entire 2011 season in to account. NOTE: The purpose here is to show what Andrew McCutchen’s value is during his control years, using projected values (calculated as [(WAR*$5 M) – Salary]) and Victor Wang’s research on prospect values. It is not to suggest that the Pirates are trading McCutchen, or that they’ve received any specific offers for McCutchen. McCutchen has a mammoth trade value of $88.6 M.
Explanation: McCutchen finished with a 5.7 WAR in 2011. Considering his age, it might be conservative to keep him at a 5.7 WAR for the next few years, especially when he saw a jump of two wins this past year. I went a little bit more conservatively with his salaries this time around. Last time I went for an $11 M a year average, although that might have been high. It’s hard to get an idea on what McCutchen’s price would be, since there aren’t many comparable players who have gone to arbitration each year. This amount is a bit more than what Justin Upton received in his extension (by almost $6 M total). I didn’t include any draft pick values. McCutchen would be a guy who would return a draft pick under the new CBA (teams are required to tender an offer of about $12 M or more), but I’m not sure that the draft pick would have the same value with the new slotting system in effect, so I left that part out completely. What He’s Worth: An $88.6 M trade value is a lot. We talk about Joel Hanrahan possibly getting a big return, and he’s only worth $20 M. One of the best starting pitchers on the market, Gio Gonzalez, is worth $31.5 M over four years. The $88.6 M is a testament to McCutchen’s skill level, and the value he comes at as a star player who is making the league minimum for one more year, and an arbitration price for three more years. On the open market, McCutchen would easily receive $20 M a year, possibly even getting a Carl Crawford type deal. The high value is why any attempt at a McCutchen trade would be impossible. According to Victor Wang’s research, a top 10 hitting prospect is worth $36.5 M. A team would need two top 10 hitting prospects, and even then they’d need to throw in an additional $15-16M in trade value to make up the difference. In other words, it would take two of the best hitting prospects in the game, plus a top 51-100 hitting or pitching prospect to get a deal done. No team has that in their farm system. I looked over Baseball America’s mid-season top 50 list to get an idea of what it would take for other teams to land McCutchen. The following list is just to give an idea of McCutchen’s value. It isn’t to suggest that those teams would make these offers, or that the Pirates would accept these offers. The Blue Jays had the highest prospect value of all teams at $83.3 M. That prospect value came from Brett Lawrie, Travis d’Arnaud, and Anthony Gose. Those three prospects wouldn’t be enough for McCutchen. The Blue Jays would also have to throw in a Grade B hitting prospect to complete the deal. The Yankees were next up with $68.3 M, coming from Jesus Montero, Manny Banuelos, and Dellin Betances. Even with those three, who ranked in the top 26 of BA’s mid-season rankings, the Yankees would need $20.3 M in additional value. That’s another top 50 pitching prospect and a Grade B hitter. The Rays have $66.1 M in prospects, made up of Matt Moore, Desmond Jennings, and Hak-Ju Lee. Even with these prospects, it would take $22.5 M in additional prospects, meaning another top 11-50 hitting prospect. The Rangers are in a similar situation as the Rays, with a $66.1 M value, coming from Martin Perez, Jurickson Profar, and Leonys Martin. Like Tampa Bay, the Rangers would need $22.5 M in additional value. There’s a reason McCutchen’s value is so high. He has good results at the plate. He hits for some power. He has strong defense. He’s fast. He’s young, and might not even be at his peak performance yet. He’s got four years of control. He’s extremely cheap during those four years in comparison to what he would cost on the open market. There were 19 hitters in the majors who finished with a WAR higher than McCutchen’s in 2011. Only 7 pitchers finished with a higher WAR. 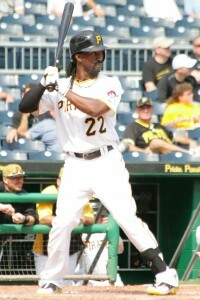 That puts McCutchen as the 27th best player in the league in 2011, and that performance came at the age of 24. We’ve reached a point where prospects are treated with an unprecedented value. I wouldn’t say prospects are over-valued, but I think teams realize now more than ever the importance of building from within. That’s why you see so many top prospects listed as untouchables, even from teams who don’t need to build through prospects like the Yankees. There’s also the tendency to look at prospects in a way that projects them as guaranteed future big leaguers, without taking in to consideration that there isn’t such a thing as a “can’t miss” prospect. This creates a problem with any Andrew McCutchen trade. It makes no sense for the Pirates to trade for one impact player. They already have an impact player in McCutchen. It might not even make sense to trade him for two impact players. Odds are that one of them might not live up to his potential, putting the Pirates back in the situation where they’re giving up an impact player for the potential of getting just one impact player. Once you get beyond two top prospects, you’re going to have a hard time not only finding teams who can pay the price, but finding teams who will pay the price. Take the Rays in the example above. If there’s one team that knows the value of prospects, it’s the Rays. They don’t trade prospects for big league players. They trade big league players for prospects. They’re also good enough at developing and identifying talent that they usually have a replacement ready to take over who is as good, or better than the guy who was leaving. A deal involving Matt Moore, Desmond Jennings, Hak-Ju Lee and two other prospects would be fair value for McCutchen, but the Rays would never take it. Their approach is to keep those prospects, hope that Jennings becomes a player who is similar to McCutchen, hope that Moore becomes one of the top pitchers in the game, and hope for the best from their other prospects. The Rays would be more likely to deal James Shields than Matt Moore this off-season. That’s just how they operate, and it totally works. Then there’s the Toronto example. Lawrie, d’Arnaud, and Gose would be fair value for McCutchen. But Toronto probably sees Lawrie alone as fair value for McCutchen (and depending on how much credit you give his 150 at-bat sample in 2011, they might be right). Rather than trading a guy who put up a .953 OPS, a guy who profiles as their catcher of the future, and a top outfield prospect, the Blue Jays would probably be inclined to take their chances on all three players, just like the Rays. The reason you won’t find any team willing to make a deal for McCutchen is the same reason why the Pirates would probably accept one of the above deals if they were actually offered. Andrew McCutchen is good, but there’s far more upside in the group of prospects it would take to land McCutchen. The only way you could find a potential deal is if you had a team with a ton of prospects and young talent that was just one piece away from competing. I’m not sure that hypothetical example currently exists in baseball, and if it does, that team might be more inclined to go with their own guys, rather than selling the farm for the missing piece. Put the Pirates in the same position. Let’s say they had the chance to get another Andrew McCutchen, but it would take Jameson Taillon, Gerrit Cole, Luis Heredia, Starling Marte, and Josh Bell. Would you gut the farm system for four years of one star player? Or would you hope that those five players produce two top of the rotation starters and one above average outfield prospect, in a best case scenario? It doesn’t really matter whether the Pirates listen to offers, or whether they’d even consider moving McCutchen. Even if they were willing to listen, and even if they would trade McCutchen, it’s unlikely that there’s a team out there who would pay proper value to make a deal happen. This all highlights the fact that he number one priority for the Pirates needs to be extending McCutchen. Not only is he their best player, but he’s one of the best players in the league. The number that gets thrown around a lot when talking about a possible extension is six years and $51.25 M. That amount is thrown around because that’s what Justin Upton received. If McCutchen received the same deal, he’d bring over $120 M in value at a 5.7 WAR each year. A six year deal would buy out two free agent years. McCutchen would probably get a Carl Crawford type deal if he keeps up this pace, which would make his free agent years worth $20 M each. That alone almost makes a six year extension seem like a value. We don’t know if this is an amount McCutchen would go for, but if his price is anywhere in that range, the Pirates should go for it. A lot of good hypotheticals there really.The only comment I really have to wonder about is that of Murray P. If you have been watching the Pirates for 40 years as you mention,what have you really been watching if you don’t think McCutchen is an above average talent ? Myself,having watched Marte for one full season at AA,I think he is already superior defensively,but a completely different type of offensive player.Now,you put McCutchen in left field,and Marte in Center,you will have a true outstanding defensive outfield. No trade with the Nationals would include Harper. What about swapping out Harper with Espinosa, and the players eeee12 mentioned. Espinosa’s first full year WAR was the same as McCutchen’s first year. Also, Espinosa could play short for the Pirates. Did you consider the Nationals? I know Rendon can’t be traded yet but a Harper, Rendon and Peacock or Cole package matches your criteria pretty spot on, no? Of course Washington would never go for that but anyways.. I looked at every team, but the point wasn’t to find a trade that would work. The point was to show that no trade would work because of McCutchen’s value to the Pirates. For the Nationals, a trade would have to include Harper plus more prospects. The Nationals probably wouldn’t want to give up more, because they see Harper as a future star. Why trade a future star and 3-4 more prospects for one player if you can just wait on that future star to arrive? From the Pirates side it wouldn’t make sense because they already have a star for four years at the least. So they’d need much more than Harper, otherwise they’re just trading a current star for a guy who has the potential to be a future star, which is pretty much a lateral move. IMO, an extension is not the right way to go for the Pirates. If they can trade McCutchen for a very good starting pitcher and a hitter with power, say a 1st basemen, if I had to take the lineup they have now with McCutchen or a lineup without him and power hitting 1st basemen, a very good pitcher and Marte in Centerfield, it is a no brainer for me, I would part with McCutchen and I would not worry so much about what he could have brought, but what the team would look like without him. The number that is thrown around when talking about a possible extension is six years and $51.25 M.
When some one says 51mil for 6 years they are really saying 11mil for 4 years and 40mil for 2 years. Will McCutchen make 11mil the next 4 years if the Pirates do nothing? It is possble that he will make 40mil for years 5 and 6. In other words, how much would he make per year for the next 6 years if the Pirates do nothing? Since they have one of the best centerfield prospects in baseball probably a 1/2 year to a year away, what do they do with him (Marte)? I think with any extension you’re really talking about the risks involved with each player. McCutchen is getting less per year than he would by going year to year and staying healthy. That’s the risk he takes. The Pirates are taking a risk by guaranteeing that much money, when they could play it safe and go year to year. The benefit for McCutchen is that he gets guaranteed money. The benefit for the Pirates is that they get a value if McCutchen stays healthy. The facts are that the Pirates do want to sign McCutchen to a long term contract, Huntington said so last year, he also said it takes two to sign a contract, I take that to mean that McCutchens Agent has done some numbers and numbers are what we go by these days and the numbers probably say McCutchen is worth more than the Pirates want to offer, the Pirates say they are gambling on McCutchen fulfilling his contract at the level he wants paid for. If he breaks his leg or gets some disability that ends his career the Bucs are stuck, players don’t care about the gambles the team has, they want the what the numbers say they should get. What all of this means is that the Pirates and McCutchen are probably a long way off and probably won’t get it together to the benefit of the fans or the Pirates, that usually means a trade will happen, probably for less than people think McCutchen should bring, the other teams know that they will have to unload him or lose him for nothing. I think we all need to step back a few years and really determine how much McCutchen is worth. Saying a comination of Moore/Jennings/Lee and 1 or 2 more top prospects would be equal trade is coming off as overvaluing a player. Plus you cant really guess the WAR that Cutch will be putting up in the next couple of years. His most valuable asset is that he is still under years of control. Look at the return for Johan Santana, Cliff Lee, Miguel Cabrera; not exactly completely loaded with stellar talent in return. It doesnt matter what we think the Pirates would deserve/need in a return for Cutch, the reality is that teams will settle for less than what the fans want. A big difference between guys like Lee, Santana, and Cabrera, and a guy like Cutch is that those players all had 1-2 years of control remaining. Cutch has four years of control remaining. Two of those years come at a very low price for a guy with his production. A reason why Cutch would cost so much is because the Pirates know what they have with him and have him for four more years at the least. It will take more than two unguaranteed prospects to make the risk of a Cutch trade worth it. yes, i agreed at the years of control. that would be a huge bargaining chip with other teams. but i dont agree on putting an actual $ amount on each year. its more of a guess than estimation. The purpose of the numbers is to make the process as objective as possible. I can’t give McCutchen a higher trade value unless it was painfully obvious. I can only take his WAR, his projected salary, and enter it in to the calculator. From there I match up his value to the values given to prospects, which was calculated based on the historical value that prospects of each category have given throughout the years. It’s not meant to be exact. It’s just meant to be better than the usual process of “What about Players A, B, and C for Player X” deals, which have nothing to support why the trade proposal is a fair swap. We might see 30 HRs from Cutch next year. Can’t trade that. I think the Rangers are the best fit out there, and if they offered Profar, Perez, Olt, and say Buckel and Mendez, I’d take a good, hard, long look at that offer. I understand the numbers, but sometimes adding ridiculous talent to a farm system when it makes more sense going forward with our current window, you have to grab that. It can blow up in your face (the Marlins trading Miggy Cabrera – Andrew Miller and Cameron Maybin did practically nothing) or it can work wonderfully (Marlins turning Beckett into Hanley and the Rangers turning Tex into Andrus and Feliz + more). Now, I’d prefer the Pirates to just sign Cutch to a long-term deal, because clearly that is the best option. It just makes sense to trade him now, when his value probably can’t get much higher, than in the future, IF the Pirates are virtually certain he won’t resign. Even then, it’s not a lock. We have him through 2015, and Cole, Taillon, Marte and Sanchez all will hopefully have some major league experience by then (cross our fingers and hope for a dream scenario) and be ready to make a big run in 2015. It seems like the best fit, but the Rangers seem to like to hold onto their guys. Under Ryan’s direction, I think this especially applies to their young arms in the system. I think if trading McCutchen is an inevitability, then it should take place after another year or two. At the very least, Marte will be more prepared, and at the very most, we’ve had two more years of production by one of the bright young stars in the game. NICE, very thorough piece, Tim. Really? On the open market Cutch would get 20 million? He’s not worth that, not even close. If Crawford at his best is the benchmark, Cutch is worth 12-14 maybe (well, in the hugely inflated baseball world anyway). He can’t figure out how to maximize his base stealing potential and his average is too low. I think I’m glad that the Bucs can’t afford to keep him for the long term if that’s the price. I love watching him, but he’s been slightly disappointing in my opinion up to now. Crawford got 7 years/$142 M. That’s after he put up a .296/.337/.444 line in his career with Tampa Bay. In his best year he had a .307/.356/.495 line. That was the only time he was above an .830 OPS. He only hit more than 15 HRs a year twice, but never more than 20 a year. McCutchen on the other hand has a .276/.365/.458 line in his career. He’s coming off a season where he hit for a .259/.364/.456 line with 23 homers. Crawford has the better average, but Cutch gets on base more often. I’m not sure of the significance of the base stealing argument, since the Pirates don’t seem to like to steal. I’d imagine Cutch would get more opportunities on another team. If MP wants to argue that no player is worth $20M, I would agree. However, the baseball market for players like McCutchen is well established. In fact, the Kemp signing re-established it. The only reason that McCutchen isn’t making Crawford money, is the artificial constraint that prohibits him from marketing his skills to any team right now. If McCutchen were a free agent today, he would be in the Carl Crawford range. Batting average is irrelevant if he is getting on base at the same rate and slugging at the same rate. He is doing both. He did it when he was 22, 23, and 24 years old. I don’t know that he’s worth $20M but he is doing at a young age what Matt Kemp was doing at the same age. The Pirates have to figure out what he is worth to them. If its too high, then he has to be dealt. If he can sign a deal the team likes, then they have to sign him. Waiting is probably a losing proposition because he will most likely become more expensive. By not signing a long term deal earlier, the Dodgers just paid for the cost of waiting. There is always one out there. Cutch is disapointing? I guess you wanted Willie Mays. He had a great year last year. If he didn’t go into a terrible slump the last 3-4 weeks he would have been close to a top 20 player. Yes, his SB pct and average are a little low but at 25 next season if he improves at all he will be at 25HR, 25-30SB, 70XBH, .280+ AVG, gold glove defense, and by the way he walked 89 times last year. How many other guys can do this? He could be Bernie Williams with more speed and a better arm. There is always one out there? Thanks for that. I’ve been a Bucs fan for 40 years and sorry, I look at Cutch and I love him, but he is our best player and he’s not as good as most other teams best players and unlike other teams, we don’t have as much to pick him up when he’s not doing well. I think Crawford at his best was way better than McCutchen. Hopefully next year he will be as good as everyone thinks he is now. It is possible that he would be better on another team where he would have more protection in the lineup. Maybe that’s what it will take for him to reach his potential, although I’d obviously rather see him do it in Pittsburgh. Good article. I think there are teams that have that kind of young talent but few teams are willing to give it up. I hope they don’t trade Cutch but if they do, Neal must get real value. Anything less is completely unacceptable.